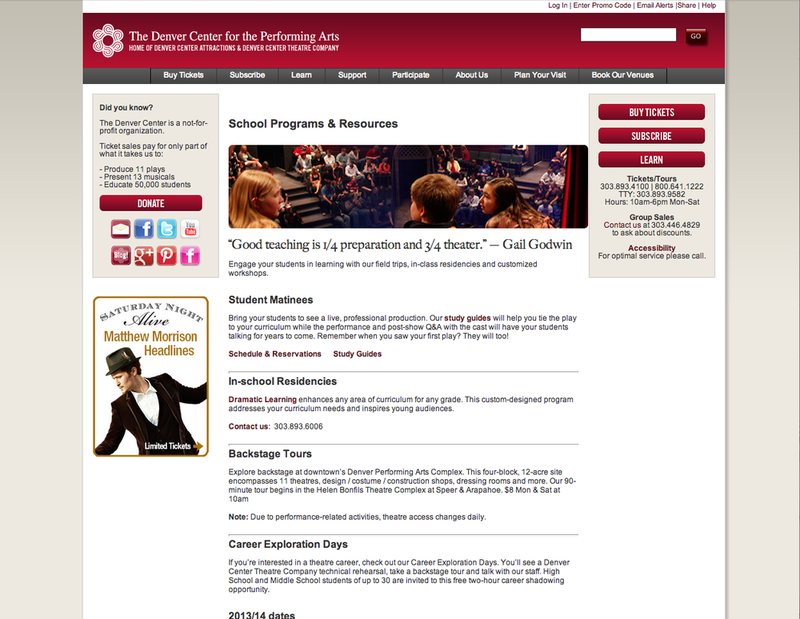 Starting in late 2012, Faction participated in a full rebrand and website relaunch for the Denver Center for the Performing Arts (DCPA). DCPA has been a Denver institution for more than 35 years, but the brand and digital presence needed an refresh and an upgrade. Over the course of two years, I was an integral part of the Faction and DCPA collaboration as a copywriter and content strategist. I did stakeholder interviews for the brand, helped moderate the audience interviews, parsed Experian lifestyle data, and examined competitor branding and messaging. One important milestone was the creation of the new DCPA brand archetype. After a card sorting session using Archetypes in Branding: A Toolkit for Creatives and Strategists by the very talented Margaret Hartwell and Joshua C. Chen, we determined which of the unique archetypes fit DCPA's new direction. From the Faction presentation deck; examining what stakeholders at DCPA said they were, versus how their audience describes them. The characteristics of the Muse, especially as they relate to DCPA. What the new DCPA brand tone would read like and sound like for all new collateral. Another major project on the way to a complete brand refresh was audience personas. We examined Experian data, DCPA's own audience database segmentation (telling us, for example, that a large segment of the ticket buyers in the system only purchased one major Broadway touring show and never purchased again) as well as the types of plays and musicals that DCPA produces. We created six unique personas, naming them after a well-known theatrical work ("The Music Man" for those who like musicals, "Quilters" for those who prefer the art and craft of theatre, etc. ), then I wrote extensive, detailed biographies for our fictional theatre crew. DCPA could now use these six personas to target content toward audience types via email and mailer marketing, for example. From the design side, our team at Faction created a new logo and brand visual elements, and we finalized an extensive brand book with all the work so far compiled together to get internal buy-in from the teams and their board of directors. Then we could start on the website, which took more than six months to complete from a design, UX, content and development perspective. Many of the UX and development pre-work for the new website, including user personas, user testing and internal stakeholder interviews, occurred at the same time the brand work was done. Each page's content was written from either existing content or direction from DCPA, making it a collaborative process throughout. I was not only in charge of writing and editing each page, I managed the flow of edits from the client side and made sure each change was accounted for and made with the new brand tone guidelines and SEO optimization always in mind. Once the writing and editing was complete, then came the monumental task of QC for the staging site before it went live. A full week was spent by everyone on the team (including myself) to do a full QC and proof on every page to ensure that the content fit in the design, to catch every error and check all functionality. 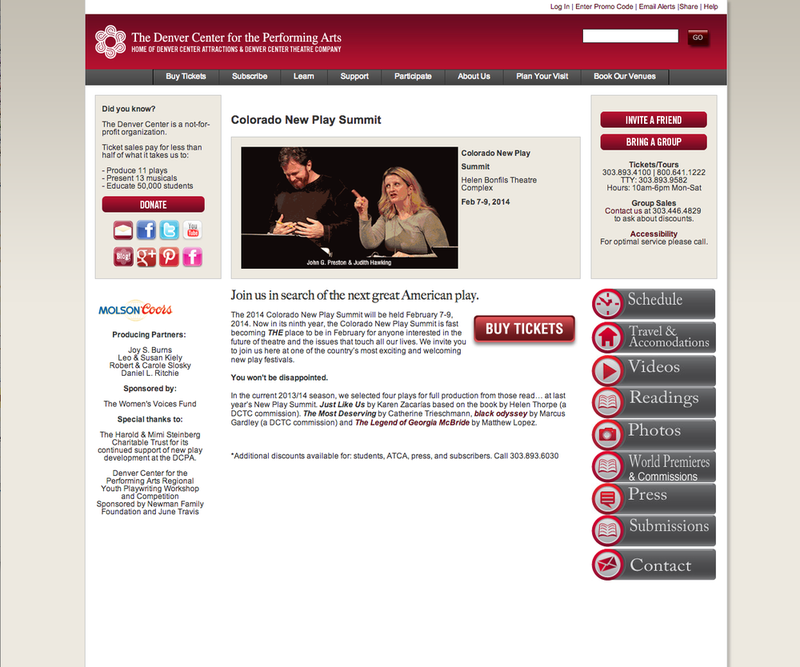 The new website and brand were the recipient of several awards, including Sitefinity's Site of the Year 2014 for Entertainment & Events, and the Colorado American Marketing Association's 2015 Silver Peak Award for Uniquely Colorado, and two Gold Academy of Interactive and Visual Arts Communicator Awards.